I saw the plot below in this answer (40MB PDF) and it made me wonder at what distance would parker fail to function. Also, at what point would it become so hot that it wouldn't be recognizable as a man-made object (at what point would it begin to melt / turn to plasma). Even a specification statement on the design limitations and absolute maximum temperature would be helpful. 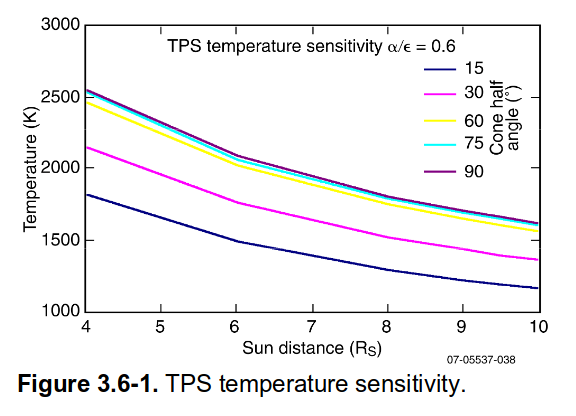 I guess I could rephrase the question as "what is the absolute temperature limit for parker solar probe" and also "how far away from the sun does it have to be to hit this limit while the shield is facing directly towards the sun"? Browse other questions tagged parker-solar-probe or ask your own question.